Finding the best budget office chair to improve posture used to be a problem. Luckily, things have changed for the better. There are now more chairs at affordable prices than ever before. From proper support to good comfort, even ergonomic chairs can offer a reliable design to sit on for the entire duration of the day. A supportive office chair needs to allow users to sit in a comfortable position with a slightly reduced pressure on the spine. Adjustability can be key here. At the same time, the materials of the chair directly impact its durability and comfort. While it is not really indicated to sit for an entire 8-hour shift, some of these chairs really show their value after a few hours. Choosing the best budget office chair doesn’t mean making huge compromises. Of course, premium materials might be rare. But reliable support is offered by some of the best budget office chairs. In accordance with these principles, the following designs can be considered by those who don’t want to invest too much in an office chair. As Autonomous’ most affordable chair, many would not expect much from it. In reality, it shows some of the characteristics needed for better posture and improved comfort. The first thing to notice about it comes with its rounded design. This ergonomic design makes it unique and it promotes proper comfort through the day. Of course, the chair is height-adjustable and it includes armrests. Interestingly, it also represents the only eco-friendly option in the affordable range of chairs. The office chair includes parts made from recycled materials. At the same time, all of its materials can be recycled as well, when the time comes. Even so, it still offers comfort for all its users. With a 250lbs weight capacity, it holds all users. There is no headrest shipped with the office chair. 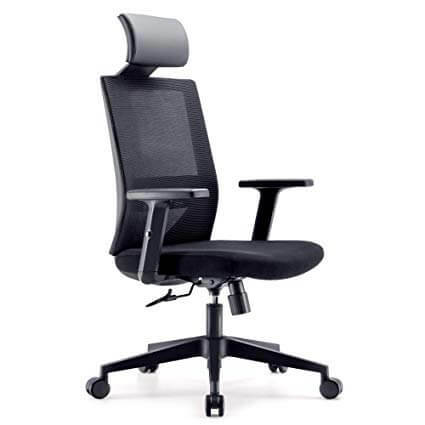 Its main support for posture comes from its backrest. Of course, its reclining tension allows for some room for adjustability, but the chair may not be recommended for those seeking full recline with head support. With one of the most intriguing rounded designs, it comes as an original solution for better support and impressive response from its cushioning and aluminum frame. With leather upholstery, the chair can be comfortable for many people. Of course, it may not be as breathable as other synthetic alternatives. This is why the chair is mainly recommended for shorter periods at the desk. It comes with a design featuring 120 degrees recline. For the moment when users want to stretch out and to readjust their posture, this can prove helpful. At the same time, its flip-up arms also recommend the chair for added practicality. Of course, the chair might feel like an affordable path into executive designs. But a few users noted it may not be as stable as expected. It comes with a slight wobble from its base, which means it might not feel to stable when fully reclined. As an affordable design with leather upholstery, the office chair can be considered by those who want to sit in comfort up to a few hours. With an ergonomic design, the budget office chair can be of value when sitting for multiple hours. Its mesh materials promote breathability. Furthermore, its frame is made based on ergonomic principles. For many users, the added headrest can also make a difference. 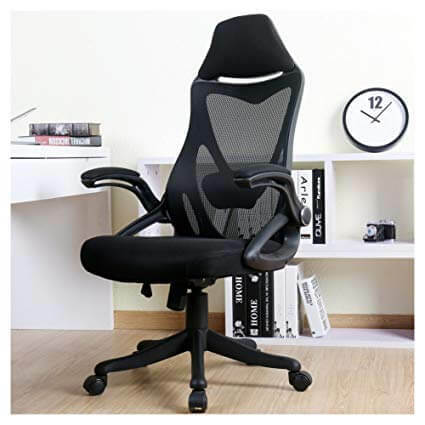 Those looking for extra help on posture improvement can also consider this office chair for its lumbar support adjustability. While the chair comes with mesh materials, it also has its own drawbacks. For example, its balance might not be as focused as those of premium chairs’. At the same time, dealing with possible issues requires patience. Multiple users have noted that the manufacturer takes some time to respond to possible issues. Made with a supportive and adaptive lumbar area together with adaptive and ergonomic armrests, the office chair might be among the designs which are used for hours and hours at a time. 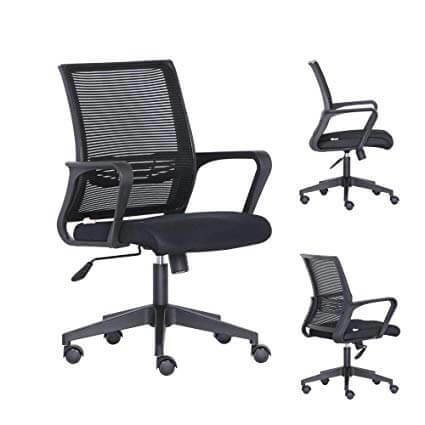 The minimalistic office chair is recommended for those who value its modern look. It can easily fit in a modern work environment such as in the corporate world. It comes with stretchy mesh materials which means it does a good job against overheating. Even with an affordable price, it has a number of certifications which might make it more attractive than people assume. For example, its legs have passed the BIMFA certification while its gas lift has also received this certification. With a 126 degrees maximum recline, it can also be used for stretching while at the desk. There is an added headrest for those who want to improve the way they sit also. With 3.7in cushioning, the chair is comfortable for hours at a time. As any budget office chair, it also comes with a few drawbacks. While its durability is fine, it seems its practicality might not be up there with some of the leading designs on the market. For example, the recline adjustment often requires users to get on their knees as it is not easy to access. With a distinct minimalistic look, this office chair is recommended for those working in a modern office environment. With a multi-purpose design, this chair can be considered for high desk and height adjustable desks. It comes with a distinct studio look which allows it to be considered for these high desks. With an included footrest, it can work for those working at a computer, for those practicing an instrument or even for receptionists. Its hydraulic adjustment also allows users to lift the chair up to 30” above the ground. When it comes to materials, the chair is nearly as good as some of its more expensive alternatives. 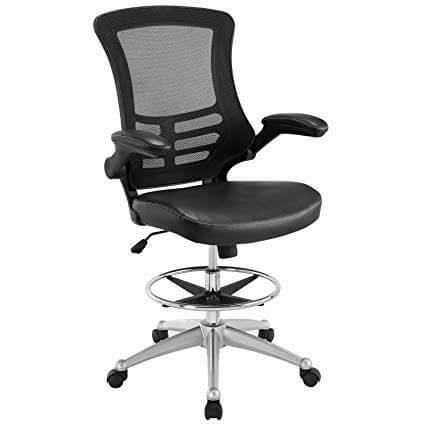 It actually uses a mesh backrest with lumbar support, recommended for those with improving posture. Of course, it also has its shortcomings. Unfortunately, many users can actually find it uncomfortable. This can be due to its seat cushion which is not ergonomic. Its front side of the seat pan is not actually sufficiently rounded towards the ground in the front which puts extra pressure on the legs. Basically, the chair can be uncomfortable for long periods of time. Combining a few good characteristics with a few unsuccessful characteristics, this office chair can be considered for its height reach. There are people who only prefer gaming chairs. While these designs might not be the most attractive choice for an office, they can certainly be comfortable. Those sitting for long hours might find it attractive. 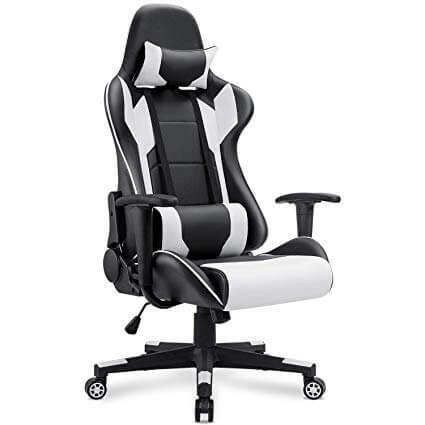 It comes with lumbar support and a high backrest design. Most users will immediately notice its cushioned design. Using foam insertions, it aims to become one of the comfortable solutions for a range of users. Even with such a bulky construction, it also manages to come with a 150 degrees recline. In terms of office integration, it might actually be considered for its rubberized wheels. They are known for their low noise performance. There are a few things users should consider before purchasing the chair. For example, its armrests are fixed, which can be a problem for all users. At the same time, all the cushioning actually put a lot of weight on the chair. It is a heavy chair and many users simply do not feel comfortable with the lack of practicality this causes. Those seeking to support their back with extra-thick foam can consider this large chair for any type of desk work. This mesh chair actually draws its design inspiration from gaming chairs. But instead of coming with a thick foam backrest, it uses a mesh alternative. Most of the design, however, remains the same. It uses the same oversized headrest and it also comes with decent lumbar support. With a tilting design, it allows users to set their own angle of relaxation in the moments they take a break from work. Versatility would not be on the mind of those about to use the chair for the first time. But many people would actually benefit from its folding arms design. This tweak allows users to actually pull the chair under the table at a time, and concentrate on work while sitting correctly. As all office chairs, Zenith’s design has room for improvement. While the base is sturdy and the design supportive, users actually find the problem to be the chosen materials. Its mesh might be a bit too harsh on the skin. Wearing a thin T-shirt comes with extra discomfort when standing for hours. With a gaming-style design and added breathability, this hybrid budget office chair can be a solution for extra support. 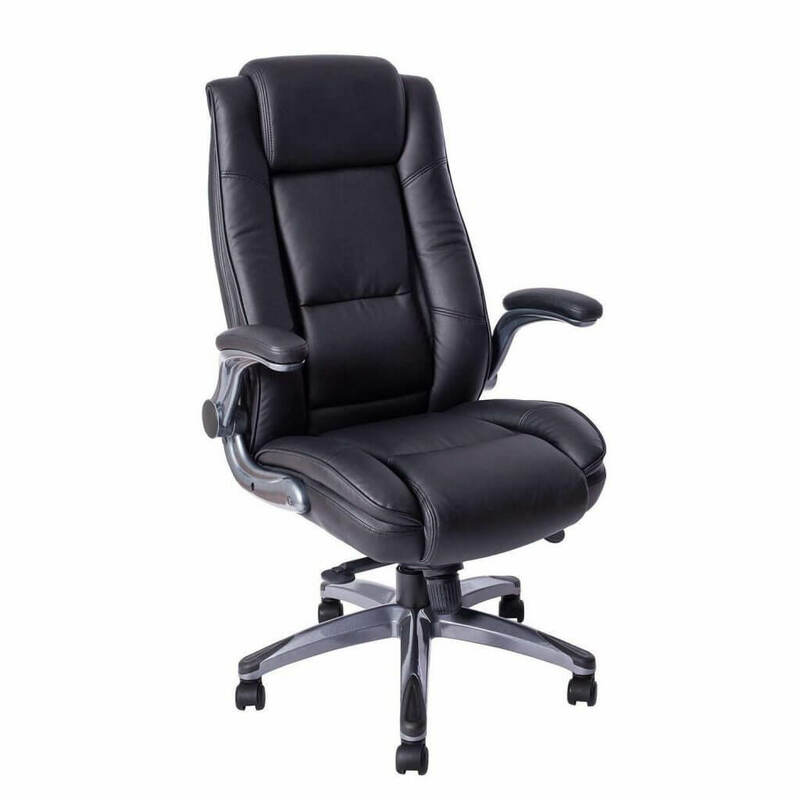 Made with PU leather, this cushioned office chair can be a budget option at the office. It has a classic appeal which makes it fit into any environment. It uses a high-density sponge to offer good cushioning. There is plenty of support to offer as well. Made to handle the weight of up to 250lbs, the chair has practical controls and it is easy to adjust both for height and for recline position. Its ergonomic armrests are also appreciated. They are made with a design which actually favors resting and relaxing the hands at any moment. There are a few corners cut to offer the chair at this price. Many users have noted that the leather upholstery is not really durable. Another problem comes with the cushioning which tends to flatten quickly as well. Those seeking a comfortable office chair on a budget can consider it with one condition. The chair should not be seen as a durable choice but rather a purchase to use for about a year or so. 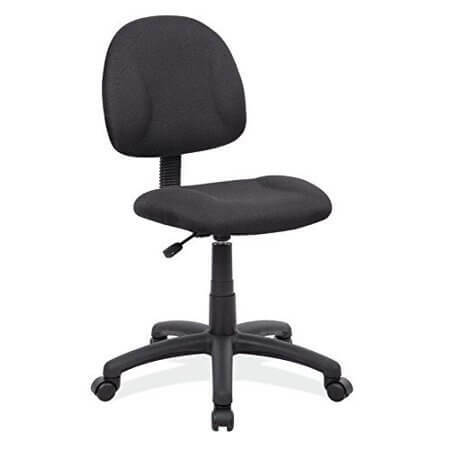 This simple budget office chair is a choice for those on a budget. There have been a few things which the chair had to say goodbye to in order to offer it at such a low price. For example, it comes with no armrests. 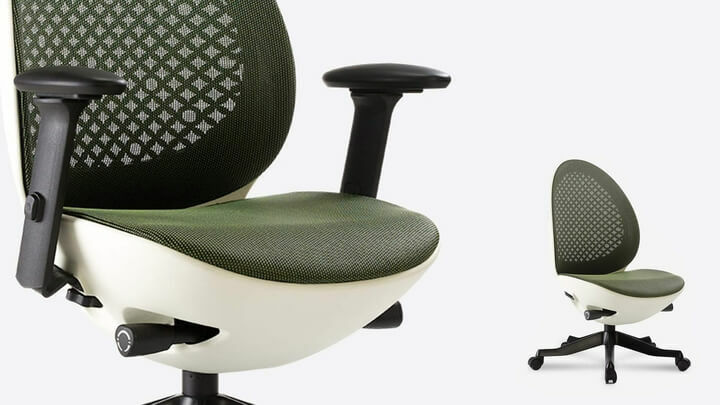 However, the cushioning is comfortable and the office chair offers thick padding for those who sit for hours. The waterfall seat pan design also means there is no unnecessary pressure on the legs. One of the main problems of the chair comes with its stability. Its minimalistic design did not allow a good balance or center of gravity. It is why extra care is needed when sitting or standing. At the same time, the lack of armrests means that workers might feel some shoulder pressure after a few hours of sitting. Being on the budget can still bring a cushioned chair to the office. 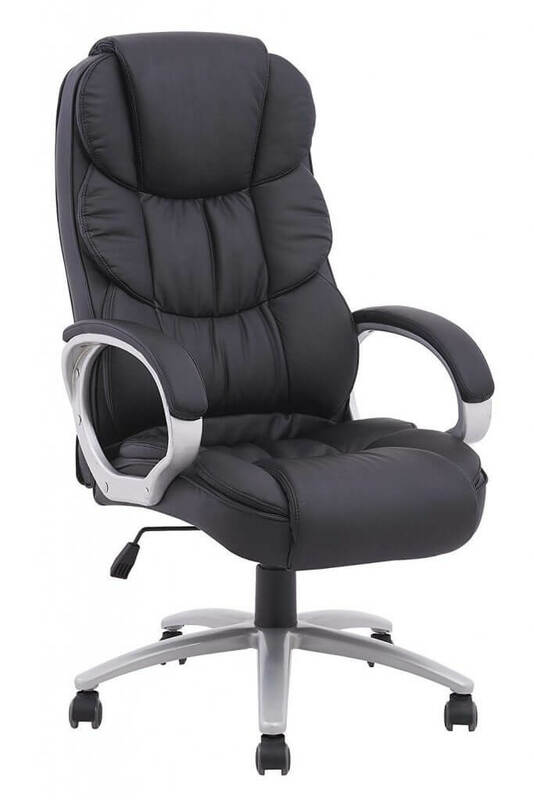 The Boss Office chair is a solution for those seeking a simplistic design. 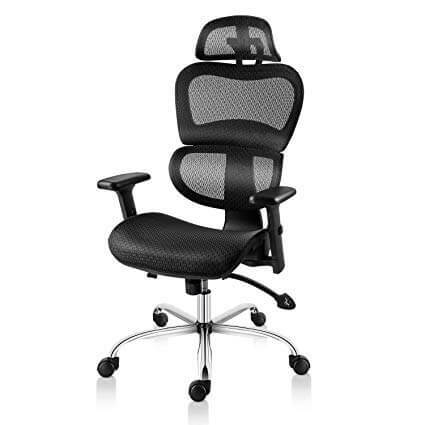 This breathable office chair is made with included lumbar support for better posture. Its heavy-duty nylon base is made with extra strength. As a result, it can handle higher weights of up to 300lbs. A recline function has also been added and it works between 90 and 135 degrees. With a minimalistic design, the budget office chair might not work well for a full day of sitting with no breaks. It is why some users have noted that a thicker seat pan cushioning would have improved this issue considerably. Those who need an extra-sturdy design with lumbar support can consider the office chair as a budget option. With so many great options to consider, those on a budget might still be able to choose a solution to suit their needs. Improving posture starts with a good chair and working for hours while sitting certainly needs a proper office chair. From lumbar support to adjustable armrests, office workers should still be able to find a tailored design to make work life a bit easier. One thing not to overlook comes with product warranty. Even at a budget range, these office chairs should still be covered by a product warranty to offer extra peace of mind for the first-time buyer.